Animal Endocrine Clinic: How Is Canine Addison’s Disease Best Diagnosed? How Is Canine Addison’s Disease Best Diagnosed? Addison’s disease (also referred to as hypoadrenocorticism or adrenal insufficiency) is an uncommon disorder in which the adrenal cortex fails to secrete sufficient amounts of its steroid hormones. These include cortisol, aldosterone, or both hormones (see my last post on Addison's disease for more information). Because these adrenal hormones are essential for life, the consequences can be life threatening when they are not secreted in normal amounts. During the initial stages of this Addison’s disease, the clinical signs are generally vague and nonspecific, making diagnosis very difficult. As time goes on, more and more of the adrenal cortex is destroyed in these dogs. overt clinical signs of Addison’s disease are generally observed. Without early diagnosis and treatment, the disease can result in a phenomenon known as an Addisonian crisis. The dog collapses in shock due to its inability to adapt to their circulatory requirements in time stress. Blood sugar may drop dangerously low. Potassium levels soar and disrupt the heart rhythm because there is not enough conserved sodium to exchange for potassium. Heart rate slows, and arrhythmias may result. The dog may not survive this episode. until they develop a life-threatening adrenal crisis. Because of the nonspecific and vague clinical signs that are seen in dogs with Addison's disease, this disorder has earned a distinct medical nickname —The Great Imitator. Chest and abdominal x-rays may reveal a smaller than normal heart and liver. These radiology changes are the result of the Addisonian dog’s shock-like state, which reduces the circulating fluid volume in the body. When screening laboratory tests are consistent with Addison’s disease, the next step is to directly evaluate the dog’s adrenal function. To do this, the veterinarian will perform an adrenocorticotropic hormone (ACTH) stimulation test. This the only definitive test for Addison's disease and allows us to confirm the diagnosis. To perform an ACTH stimulation test in a dog with suspected Addison’s disease, we collect a blood sample to measure the level of cortisol. We then administer a dose of ACTH, the pituitary hormone responsible for the release of corticosteroids in times of stress. After an hour, we collect a second blood sample to measure the dog’s serum cortisol concentration once again. (For more information on the protocol for ACTH stimulation testing, see my blog post written for vets and vet technicians). In healthy dogs, the baseline cortisol concentration is normal, and ACTH will stimulate the adrenal gland to secrete cortisol. 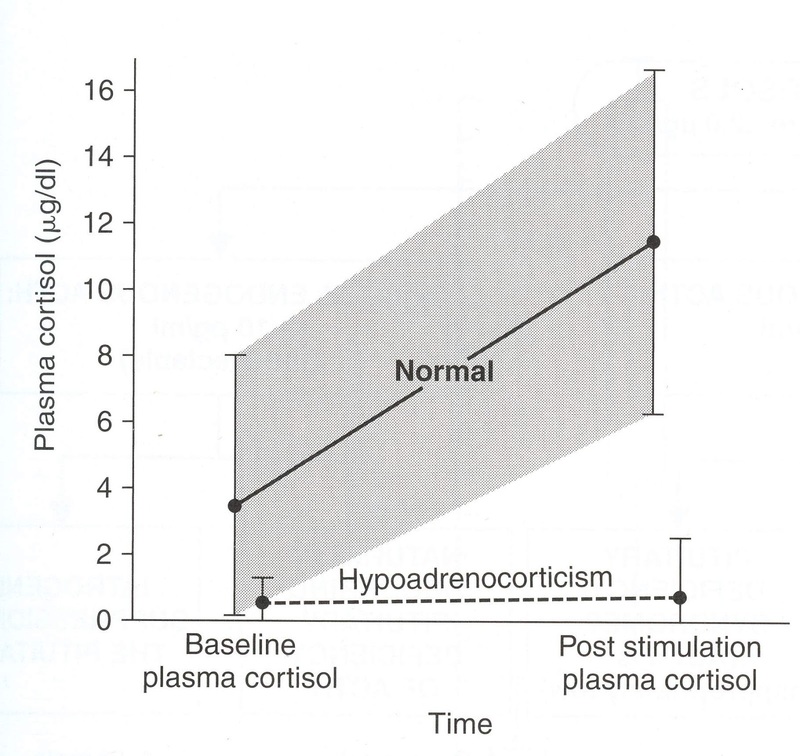 Generally, a 3 to 5 fold increase in cortisol occurs after ACTH injection (see Figure below). 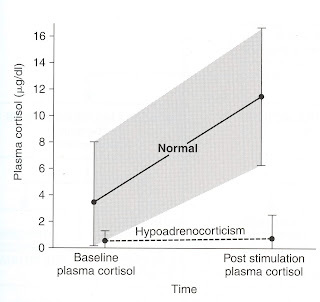 In contrast, dogs with Addison’s disease (hypoadrenocorticism) have a low baseline cortisol concentration (before we administer the ACTH) and show little or no rise in the cortisol value after the ACTH injection (see Figure above). The subnormal levels of cortisol combined with the lack of cortisol response after ACTH stimulation is diagnostic for Addison's disease. The finding of severe serum electrolyte disturbances (i.e, high potassium, low sodium, low sodium/potassium ratio), together with subnormal cortisol values that fails to rise after ACTH injection (see Figure above) is diagnostic for primary Addison's disease. However, in dogs with secondary and atypical hypoadrenocorticism, the serum electrolytes are generally normal, making diagnosis more difficult. 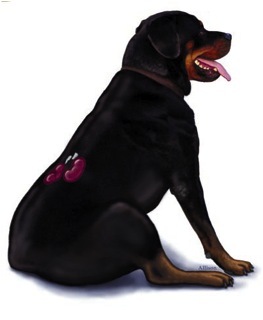 In these dogs, further diagnostic testing is recommended, including determination of the pituitary hormone, ACTH, or measuring serum concentrations of aldosterone - the adrenal hormone responsible for maintaining normal serum electrolytes. For more information, see this blog post on atypical Addison's disease I wrote for veterinarians. In my next post, I'll discuss our treatment options for this life-threatening disease. My 13 year old spayed female bull terrier has increased thirst and urination and otherwise acts normal. After ruling out other possibilities, our vet wanted to test for Cushing's and recommended ACTH stim test. Otherwise, bloodwork was normal, urine test normal except for being dilute and the only other finding was larger size of adreanal glands on ultrasound (high end of normal). ACTH stim test result shows a possible Addison's disease, rather than Cushing's - the vet mentioned the value of 2.1. Does it make sense that it could be Addison's considering that the glands are larger rather than smaller than normal? We were asked to come in for a repeat ACTH stim. If it is Addison's would the treatment help with increased thirst/urination. It seems like those seem to be the side effects of medication given for Addison's. I found out the values for the first ACTH stim test - 2.5 pre and 2.1 post. The cortisol values are not diagnostic for Addison's disease -- too high. We expect value less than 1.0 µg/dl with Addison's. Thank you, Dr. Peterson. I tried to make an appointment with you for a second opinion, but was told you are not seeing new patients. Repeat ACTH was 2.1 pre and 1.8 post. Primary doctor thinks that this might indicate beginning stages of Addison's but suggest that we get a second opinion with the specialist.